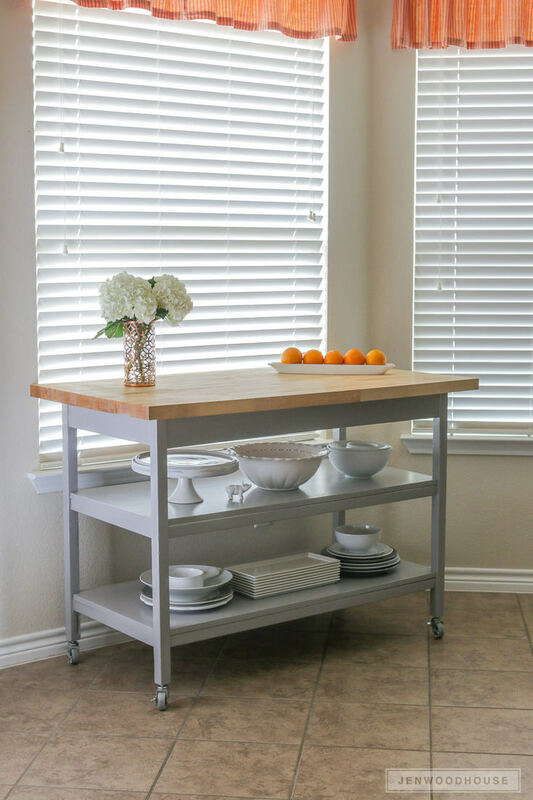 A small home just screams out for a DIY kitchen island to add workable space. I know mine does! Extra points for wheels and built in storage. 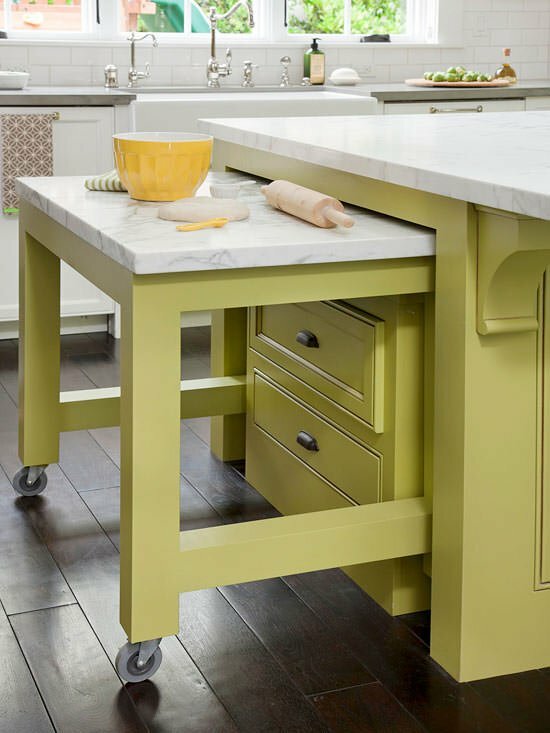 Our first post on how to make a kitchen island was so popular, we found some more great ideas for you. (See the bottom of the post for that link!) 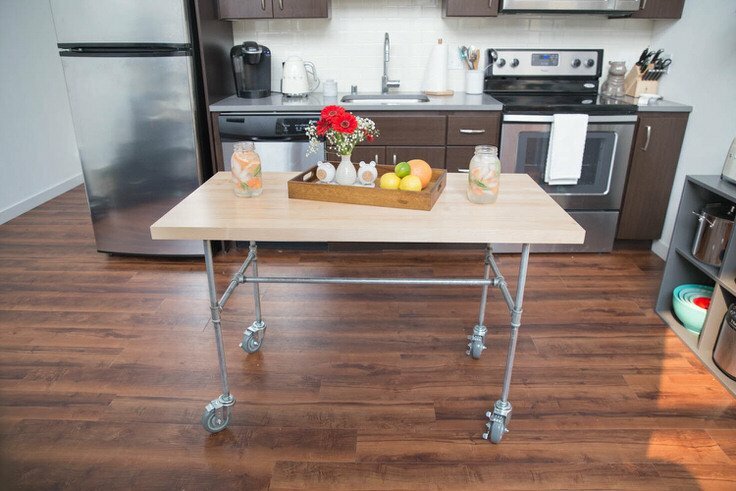 Whether you only need that extra counter work space at the holidays and for entertaining, or you just need space period, we have a DIY kitchen island tutorial here that will work for you! Learn how to build a kitchen island with the ‘Classy Clutter‘ tutorial! 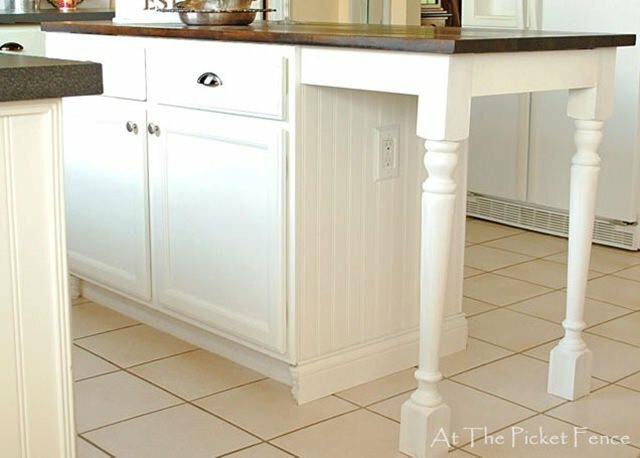 They used an unfinished cabinet as the base for this kitchen island, but we love the idea of using a recovery cabinet from a salvage store too. The navy paint is right on trend. Love this project! Click over to see the rest of their kitchen remodel! ‘Turtles and Tails‘ show us building a kitchen island can be a project even for a beginner woodworker. This tutorial has tons of step by step instructions and photos. Build this in a weekend! 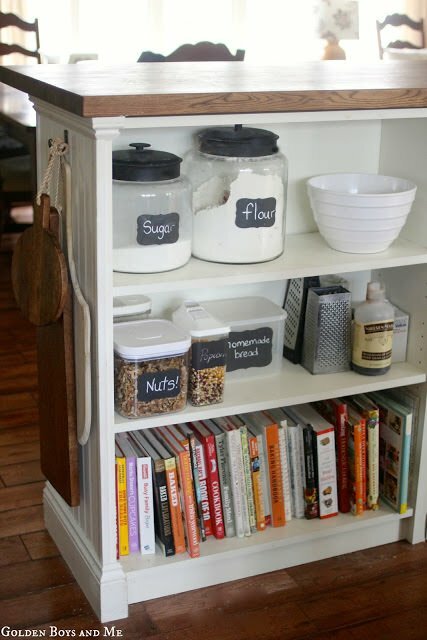 ‘Kreating Homes‘ made this DIY kitchen island from older Ikea bookcases and some legs. 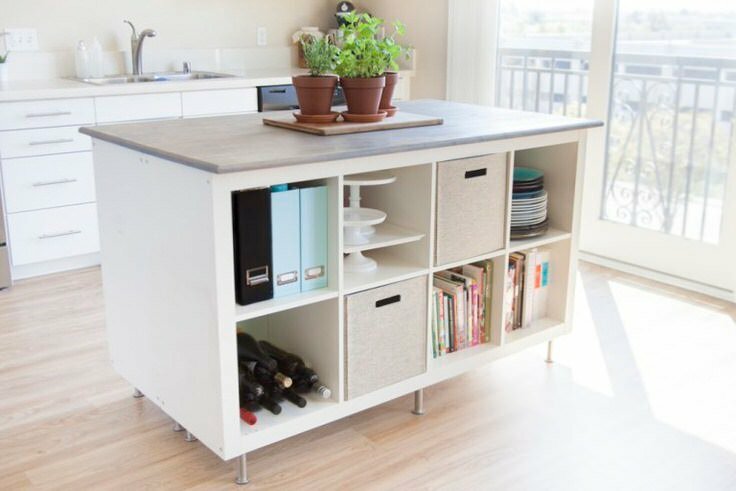 They added the cool fabric “drawers” and some other amazing storage hacks to create the ultimate, but easy kitchen island! Some butcher block and some pipe from the home improvement store made this cool DIY kitchen cart on wheels. Step by step photos from ‘Dunn Lumber‘. Portable kitchen island! 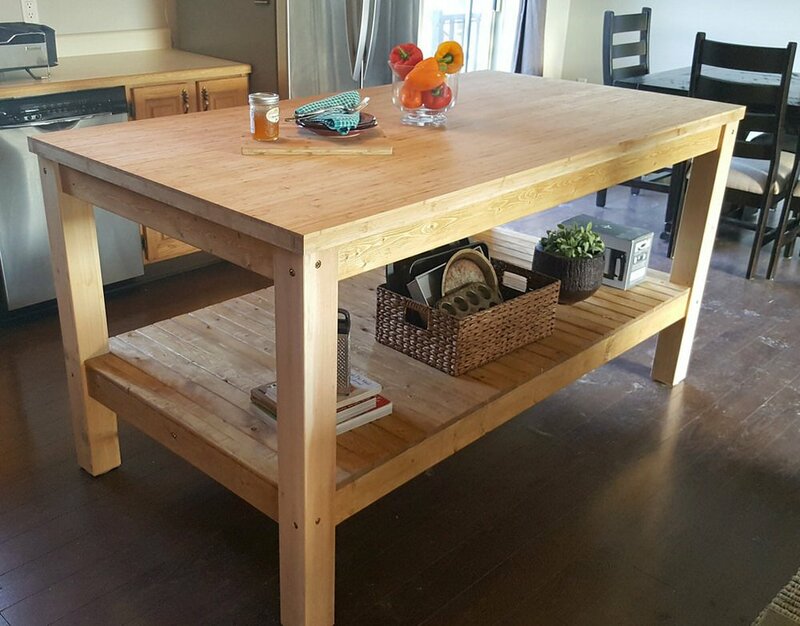 This easy DIY kitchen island is made from butcher block and some lumber, along with these easy plans from ‘Jen Woodhouse‘. We love the soft gray color of the base, and the shelving adds lots of kitchen storage. And yes, it’s on wheels! 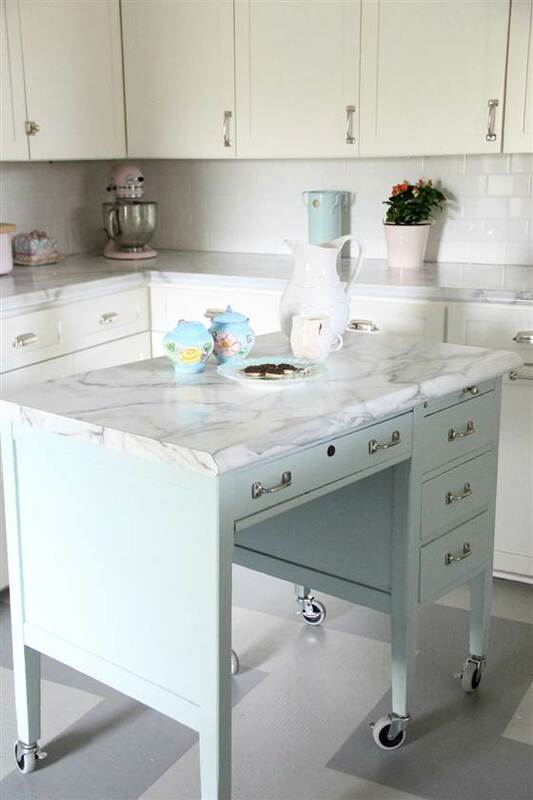 You have to love this Ikea hack DIY kitchen island from ‘Golden Boys and Me‘… did this ever add storage space! You could scale this down in size for a smaller kitchen. They used 3 Ikea bookcases, and a butcher block top from Ikea, which I know for a fact are pretty inexpensive. Smart project! ‘My Old Country House‘ made this DIY kitchen island from an old desk, some wheels, and a top made to match the counters. Stunning project! So cool, as a matter of fact, the ‘Today Show’ featured it here! Drawer storage, wheels for portability, my favorite color, retro feel… what’s not to love?! 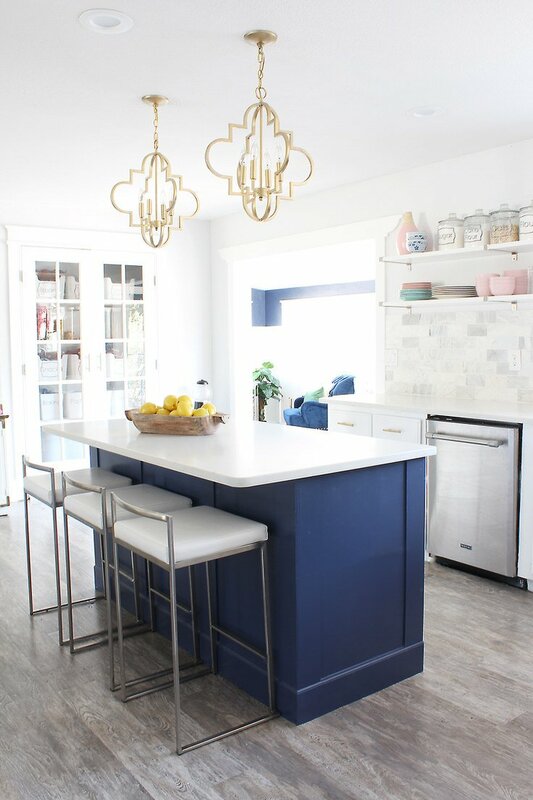 Heather, at ‘At the Picket Fence‘ just had her kitchen remodel profiled in Better Homes, and she shares her great DIY kitchen island tutorial! This is so much genius, because they took an existing, outdated island, and remodeled it into this farmhouse style butcher block island to be proud of! Love! 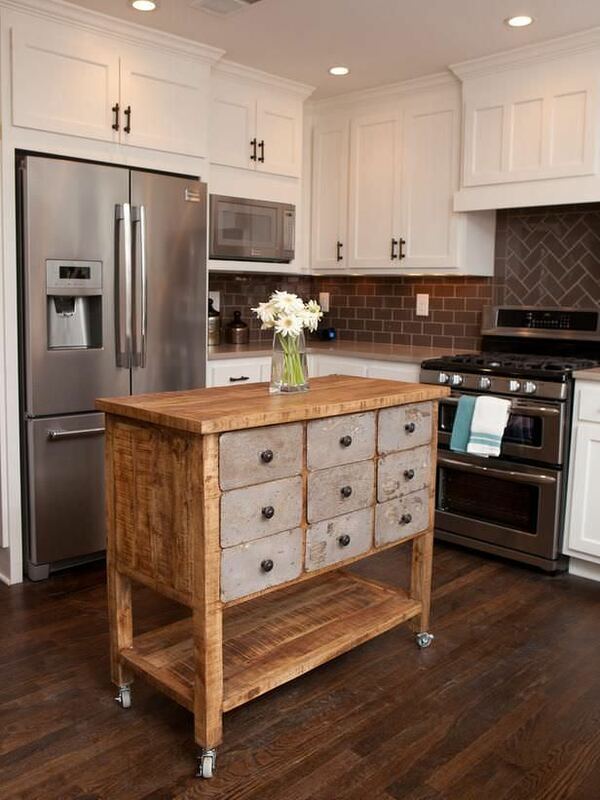 This is a space saving kitchen cart inspiration from ‘BHG‘. Finally, love the inspiration in this photo… by The Property Brothers from ‘HGTV‘, this apothecary style kitchen island could be DIY’able… just add legs to a cool vintage cabinet with drawers! We hope you loved our post on DIY kitchen islands! 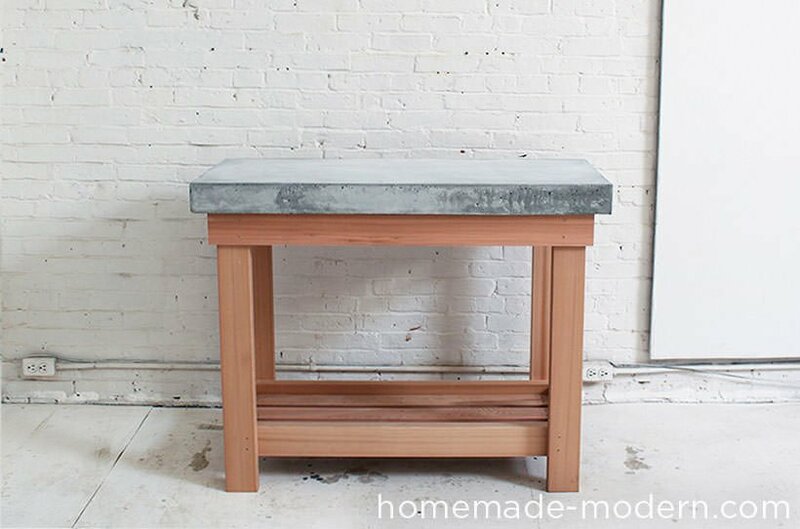 Be sure to check out Part 1, how to make a kitchen island. Also, check out our posts on Small Bathroom Makeovers and Small DIY Mud Room Ideas! The apothecary style kitchen is an enduring classic. Can’t figure out how to “Follow” you. Are you wanting to receive our emailed newsletter, or “Follow” us on Facebook? To sign up for the newsletter, enter your email in the box at the top right hand side of any page… If you want to follow us on Facebook, go to https://www.facebook.com/HomeGardenDIY365/ and click “Like”. Hope that helps! Fantastic ideals and they all looked great .Liked the pull out counter the best Thanks for sharing. Also looking for the link to the first island. Where is the link to the first island shown? Green with marble top and rollout pie station. I love that one. I absolutely love your concrete kitchen island idea. Being in the concrete industry I love anything made with concrete – but this project is great for DIY’ers and the end product looks amazing. Thanks for sharing!